Last month I started this series with information on how to upload your book to the various vendors and distributors. This month, I'd like to explore one of these vendors: Kobo. I've been direct with Kobo ever since I debuted my first novel in September 2014, but it's really only been in the last six months that I've averaged more than $20/month there. Soo.. a little less than two years. Which I know for some it's hard to let go of the KU income for something that takes that much time to get going, but for me, I decided early on that I was going to be on all platforms for several reasons and that I was in it for the long haul. 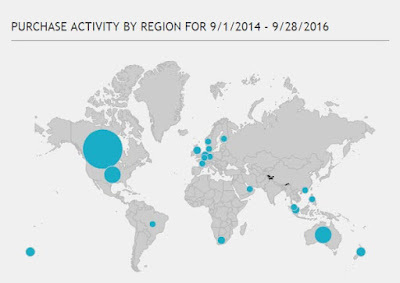 One of the most important things to keep in mind is that Kobo is bigger outside of the US, so just because you don't hear about Kobo here doesn't mean it can't do well for you internationally. Take a look at where most of my sales happen--that big dot? Canada. Kobo has a special tab that isn't automatically visible to you which allows you to go in and see what merchandising slots they have available, their cost, and what dates are available. To get this tab, you need to ask if you can be part of their Beta testing for their Promotions. I sent a friendly email to writinglife@kobo.com requesting to be added to their Beta (don't demand it--it's not something they're obligated to do) and I was granted access. Now for me, it's a menu item at the top along with Dashboard, eBooks and Author Services. If you're approved for Beta, you'll see a list of which genres have promo opportunities for you to participate in. Apply for any that make sense. You want to be dogged about applying, though. I applied multiple times before I finally started getting approved. But once I did, this definitely accounted for the traction I started getting. Check out where I landed after my Daily Deal promo in July! I hate putting this on here, because this isn't easy to get. But the last two I did were international, and so I really noticed a difference in my Kobo sales than the time I did a Bookbub without doing international. I also timed it with some Kobo promotions and that helped tremendously. The above Daily Deal for Must Love Chainmail was done in conjunction with a Bookbub promo. Apparently Kobo buyers love them some boxed sets, and not of the 99-cent kind. I've heard of authors bundling an entire large series and pricing it in the $20 range (but it was still a bargain for the reader since buying all of them individually would have been more) and killing it. And since Kobo doesn't penalize you for having something priced higher than $9.99 you get your full 70% royalty. I'm going to be bundling my first three and placing it there and on iBooks. I'm trying to decide if I should do an exclusive deal there or not. Some authors are doing their bundles everywhere, but doing something "extra" for Kobo and iBooks that's exclusive, like a short story or a DVD Extras-type note from the author to the fans. And they make that content bonus different for these two vendors so each can position the title in their merchandising as exclusive to them. When I reached out to Kobo, they said to let them know about 6 to 12 weeks in advance so that "there’s plenty of time to get titles in front of the various merchandising promotions being scheduled." I haven't had much luck targeting my ads to Kobo users, but I've talked to other authors who are getting traction with their ads shown in Canada, the UK, and Australia. I might try again when I have the boxed set. I also have my backmatter specific to Kobo, with links to my Kobo pages for my other books. I also always have them on the book pages of my website as well. Whenever I have a newsletter with buy links, I make sure to include Kobo's. It makes no sense to try to go wide, all the while only providing links to Amazon and wondering why you don't get the love elsewhere. I haven't even tapped the full depths of Kobo, so I feel premature in talking about it as compared to other authors, but here's hoping this will help you start seeing some movement there like I have. I went to the Kobo panel at Romance Writer's of America this summer led by the Director of Self-Publishing & Author Relations, Mark Lefebvre. I was impressed by how author-centric their company is and they revealed new stats we'll be getting soon on our Dashboard, like being able to see where people typically stop reading our books! I've also found the team extremely responsive to questions and concerns. 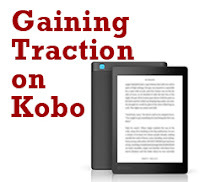 Have you gained traction on Kobo? What are some of the ways that helped you there? Thanks for this. I took a couple of 4 book boxed sets wide and a single novel too about 4-5 months ago to include Kobo. My sales there are a trickle but I've done no marketing directing readers there. I'm going to try and get into the Beta, first thing and then start running some promos there. I've tried multiple times to get a Bookbub but no luck so far. There's so much to learn about being a writer! Thanks for the info, Angela.